Want to try our new catalogue and offer feedback? We're designing a new online catalogue for our collection and we'd like your feedback. View this short 2 minute video to learn more. 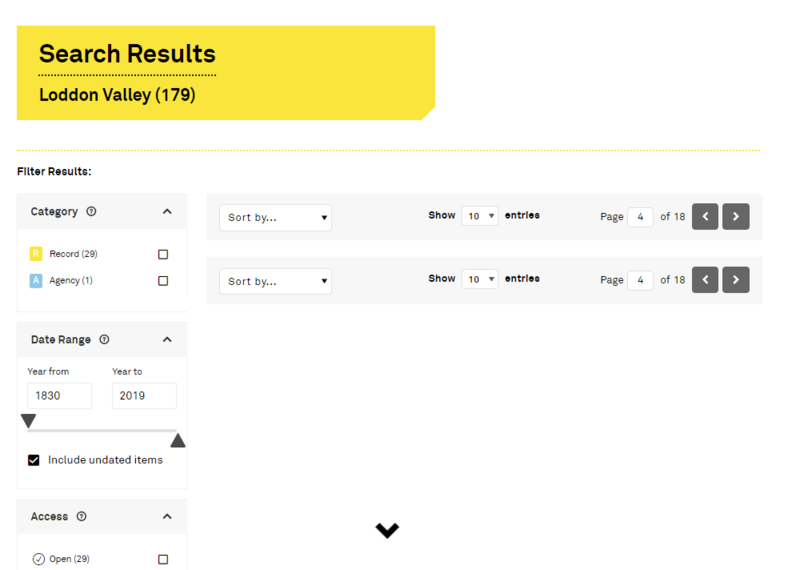 If you'd like to explore our new catalogue interface while it's under development simply search as normal, and when the results appear click the toggle slider at the top of the page to switch 'Beta search on/off' to see the new catalogue interface with the same results. If you're experiencing problems try clearing your browser history (this is usually listed as an option on the top right of your Chrome, Firefox or Safari browsers) and then type in prov.vic.gov.au. If your browser is automatically adding www to the beginning of this url it won't work, so you may need to clear your browser history again. 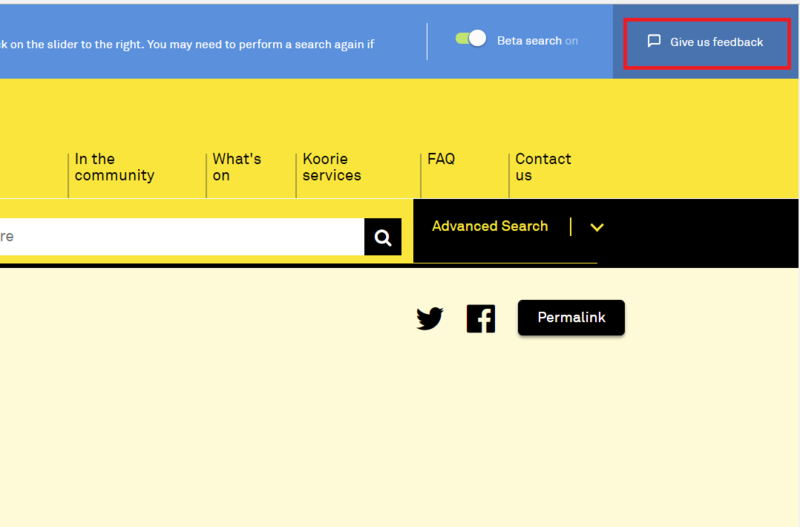 If you want to return to the old catalogue interface simply click the toggle button back again. 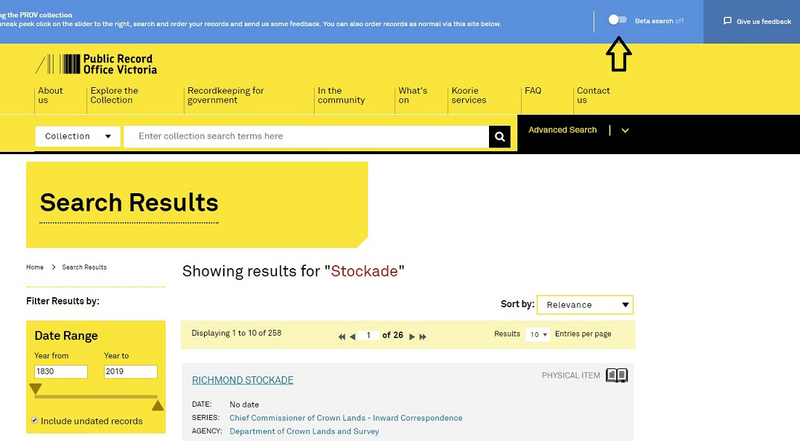 You may notice a number of results are listed but no details are appearing in the results page. This is because not all our detailed data has been added to the new catalogue as yet, but it will be over time. Simply toggle back to the current catalogue to view those item details. 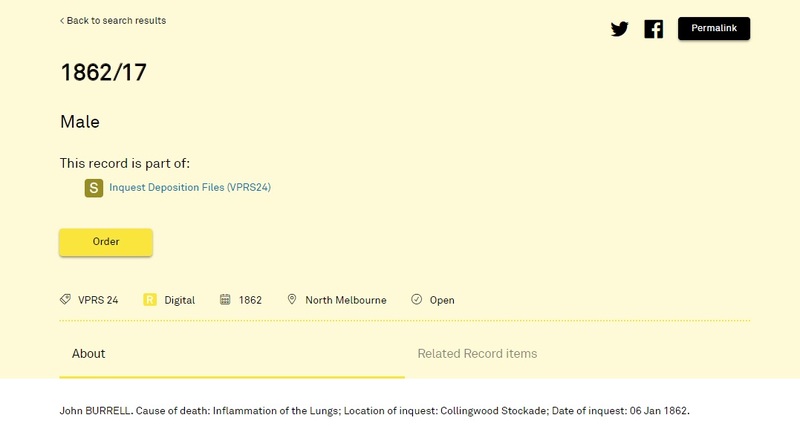 In future all digital copies of records will appear as a small thumbnail next to the item result. By clicking on the thumbnail you will be taken to the item results page where you can download that item at various sizes and even zoom in on the item to read it. When you have found the item you wish to order on this new beta catalogue, click on the 'order' button and you'll be instantly redirected back to the old catalogue page for that item to complete your order. You must click on the order button again to complete your order. On our new 'beta' search results page you can filter by multiple elements (facets) at the same time, and then easily remove them one at a time from the top of the search results page. 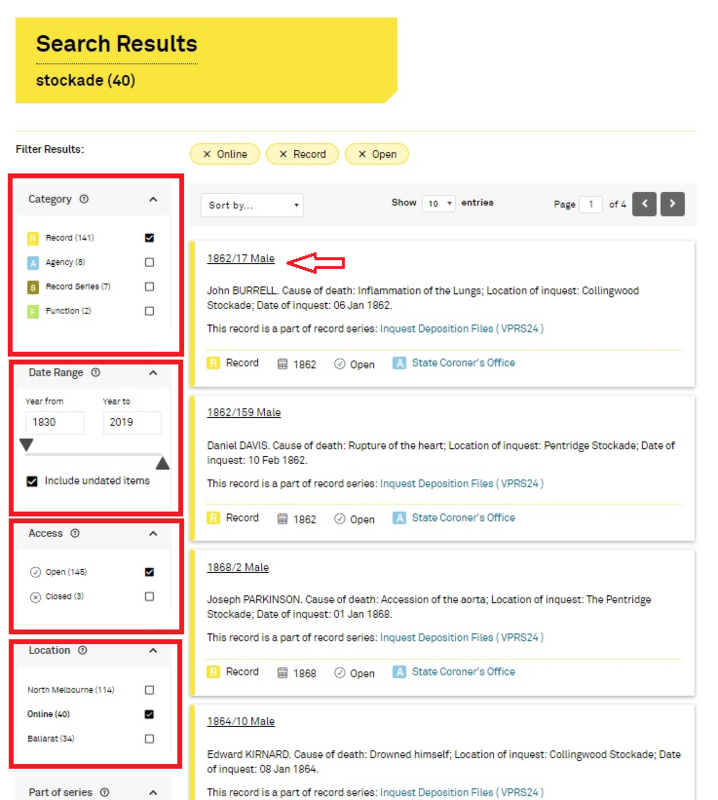 You are now able to simultaneously filter by date range, location (including online ), the series the record comes from, or even by the agency that created the record. If you filter by too many facets and no results appear then you simply remove the the filters from the top of the page. 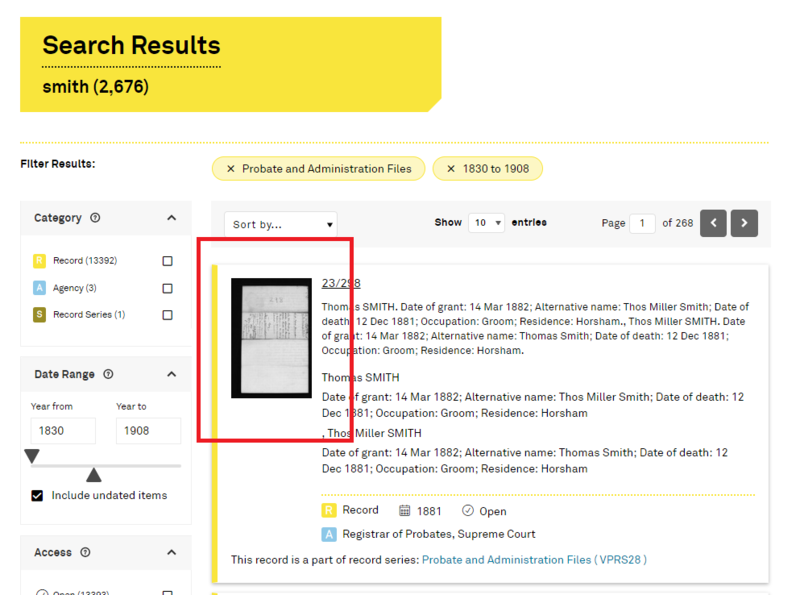 The new beta catalogue interface reflects recent changes to the archival control model. This is the model we use to consistently catalogue the state archival collection so it can be accessed over the long term. Consignment was a term used to describe a group of items that were added to the collection at the same time, but in the new model consignment has been removed and researchers can now browse items in the catalogue without needing to click on the consignment first. 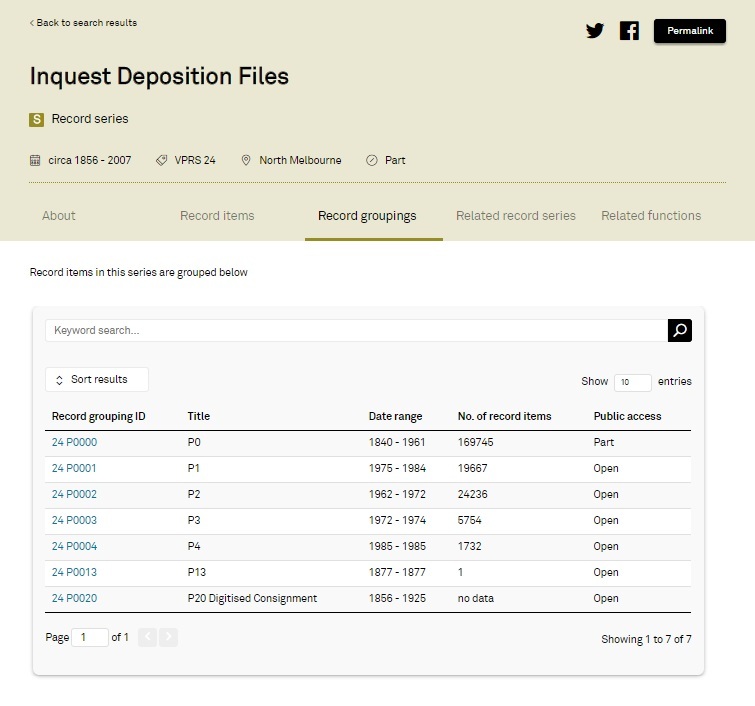 If you are an experienced researcher and you are familiar with a specific consignment and wish to find a record via its original consignment you can still locate those consignments under the tab 'groupings' on the record series page. By clicking on the feedback button on the blue bar on the top right of this website you can provide us with valuable feedback to help meet your needs.